If there is odor build up in your RV from such sources as food, mold or mildew, gasoline or other objects, there are of course ways to get rid of the smell. Scented candles and sprays will certainly mask the smell until the candle burns out or the spray dissipates. Aerosol odor eliminating sprays may rid the area of the aroma, but can be harmful to the environment. 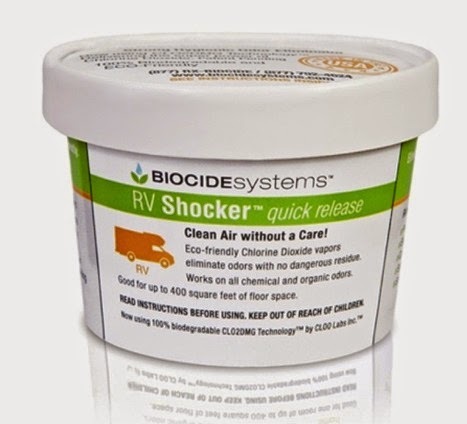 The Biocide Systems RV Shocker Odor Eliminator provides an environmentally friendly way to get rid of odors, rather than just covering them up. The Biocide Systems RV Shocker Odor Eliminator is not complicated to use and comes with almost all the necessary ingredients. Simply shake the micro-generator pouch and remove it from the outer envelope, add water to it and then leave it alone. It uses chlorine dioxide to create a vapor that fills the space without harming the materials it may come in contact with. A single RV Shocker can cover RV interiors up to 400 sq. ft., while larger motorhomes may need two. It is completely biodegradable and can get rid of odors in just 5 hours, while particularly strong odors will be gone in under a day. Using the Biocide Systems RV Shocker Odor Eliminator provides a safe, easy way to remove foul smells from the air. Because it does not use harsh chemicals, there is no residue to clean up afterwards. Other versions for cars or interior rooms are also available and the products are made here in the USA. Are Towing Mirrors Really Necessary?